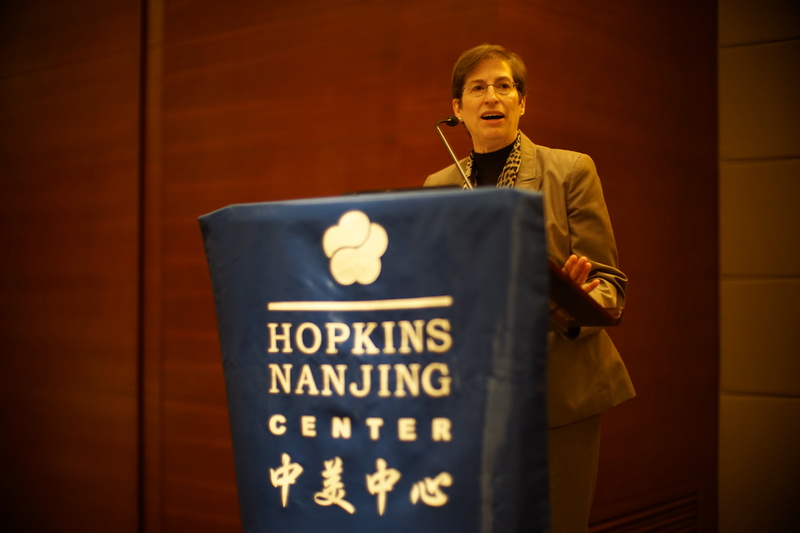 Beth Keck, a SAIS alumnus and senior director of Walmart’s Global Women’s Economic Empowerment Initiative, hosted a two-day mini-course on corporate social responsibility (CSR) at the Hopkins-Nanjing Center. The course, which took place on Monday and Tuesday, March 17-18, included over 30 students. 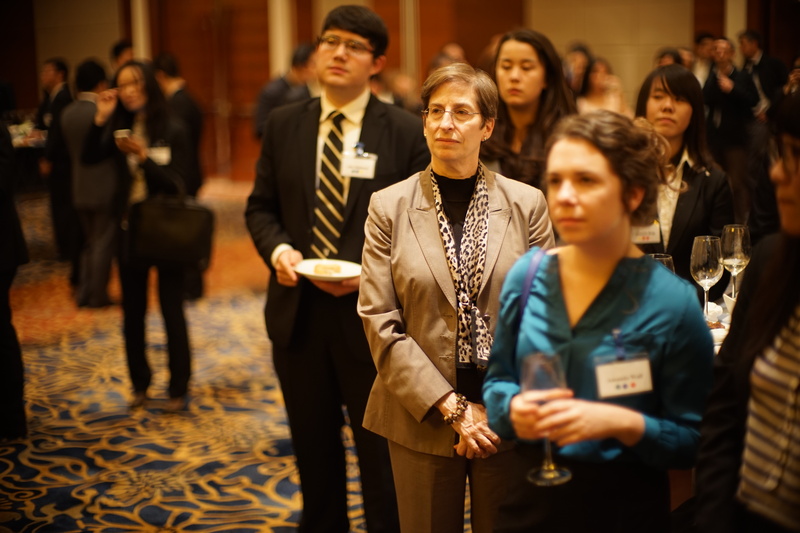 “Success has many dimensions,” said Keck, who also served at the keynote speaker at SAIS Nanjing’s Shanghai Career Day. This concept, which was central in a discussion on career development, also proved relevant to the CSR mini-course that made use of students’ varied backgrounds, skills and academic specialties. During the first half of the course students reviewed the fundamentals of successful corporate social responsibility programs and ways in which companies benefit from CSR initiatives. Afterwards, HNC students presented their own policy recommendations for designing new CSR programs. The multidisciplinary nature of corporate social responsibility is reflective of the skills students develop at SAIS’ three campuses. As students brainstormed ideas that combined sustainability guidelines, social responsibility, and foreign market know-how, innovative plans for some of today’s largest corporations began to emerge. One project specifically targeted mobile cell phone waste in China. The project profiled the United Nation’s “Solving the E-waste Program,” known as the StEP initiative, and applied it to the Chinese market. Students suggested potential partnerships between mobile phone retailer China Mobile and the StEP group. Cell phone use in China is particularly high, and cell phone product life cycles are much shorter than in other countries. According to Forbes, China mobile has the potential to sell 15 million iPhones in 2014 alone. With this data, HNC students at the CSR mini-course highlighted the benefits to consumers, retailers and recyclers of launching CSR programs targeting the mobile phone industry. Apart from this initiative, students also profiled the CSR programs taking place at Starbucks, the Linden Center and Tesla. Some students involved in the course are also working on similar projects on their own time. This year’s HNC cohort of Hassenfeld Social Entrepreneurship fellows are designing an online CSR curriculum that targets companies in Asia. The program, which is under development, will offer short videos explaining the fundamentals of corporate responsibility programs, and how to successfully implement these initiatives. For organizations such as APCO or Walmart with extensive programs already implemented, the Hassenfeld team will propose better ways of marketing and engaging staff in these programs. Currently, the Hassenfeld cohort has also sought general advice from employees at the Shanghai-based Social Venture Group (SVG), which is working to foster a healthier social sector in China through education, consulting and advocacy. SVG was also in attendance at Career Day, and has informally advised last year’s Hassenfeld group, Nanjing Volunteers. Nanjing Volunteers will launch an online platform in April for Nanjing-based NGOs and volunteer groups to share information, coordinate events and recruit new members and donors. Groups outside of the HNC such as Nanjing Community Outreach (NCO) have lent their support and technical resources to the project as well. As CSR initiatives continue to grow at the Hopkins-Nanjing Center, the skills students gain from this program will increase as well. With the upcoming launch of the new Energy, Resources and Environment (ERE) concentration next fall at the Hopkins-Nanjing Center, the dynamic between students and their surroundings are changing. As a result of these CSR-oriented projects, students are viewing the local population, potential internship employers and local companies in a new light, and finding new avenues for cooperation.